Increase the value of your home– Most likely the highest bathroom remodeling benefit is the growth in your home’s value. Remodeling Magazine estimates that U.S. homeowners will get just about 71 cents back from every dollar they spend on remodeling or updating their bathroom. So not only will you get to experience all the upgrades and comforts with having a new bathroom, but you’ll also recoup the majority of your investment when or if you decide to sell your house. Since prospective buyers place a huge importance on a remodeled up to date bathroom, those homes are more likely to sell more quickly than houses with an older, outdated bathroom. Fixing current problems– this can be a simple as a paint to cracked or loose tile, leaking shower/tub valves, or cabinets that are falling apart. Please remember that anything that is leaking water can lead to mold in your home and that is something you absolutely do not want to deal with. Sometimes you just need more storage space– Do you feel like you have outgrown your bathroom space? Maybe your family has grown in size? If your bathroom is overflowing with people or products, it is time for an upgrade. Whether the bathroom needs the speedy addition of a few cabinets for storage or a complete bathroom remodel, the end result will be a more relaxed space that cuts down on clutter and gives everybody more convenience and solitude. Turn your bathroom into your personal spa– Most people begin and end their day in the bathroom and nothing can be more comforting than some quality time spent in your custom made shower or bath tub. Creating soothing lighting with warm colors can also be a great way to relax as you get ready for your day, or unwind from a hectic one. You just want a change – Sometimes the best reason for a remodel project on your bathroom is because you are simply not happy with it’s existing look and feel. Possibly you have redesigned other parts of your home and the bathroom doesn’t fit the new scheme anymore. Regardless of the reason, choosing a bath remodel is as easy as deciding to try something fresh and new. 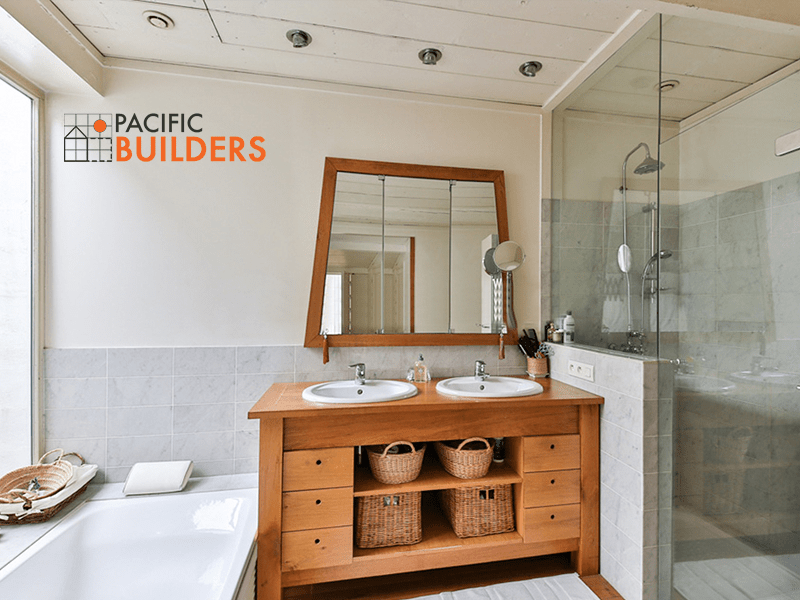 Pacific Builders has been serving the greater Sacramento area since 1947 and are devoted to providing the best services and products at an affordable price. Contact your local Sacramento bathroom remodel contractors today for a free consultation.